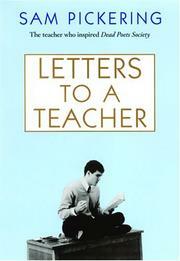 An eclectic, uneven collection of ten essays recast as letters addressed to veteran and beginning teachers. The essay is Pickering’s (English/Univ. of Connecticut) favored genre, and this offering, like his others (A Little Fling, 1999, etc. ), shows both his strengths and weaknesses (as writer and as teacher). Dead Poets Society, Peter Weir’s 1989 film about an unconventional English teacher, was based, in part, on the screenwriter’s memories of Pickering’s classes, and Pickering tells us that he has found it “impossible” to escape the umbrella of that film (yet—and here’s the rub—he also opens that umbrella in many of these pieces). The essays mix advice, anecdote, criticism, memoir, silliness, poignancy, pomposity and platitude. At times, they also read like journal observations, stitched together with the threads of illustration and rumination. Generally, the topic sentence reigns. “A teacher must be patient and incredibly flexible,” Pickering observes atop one paragraph, then muses below about inflexible schools, quotes a friend named Josh, ends with a Palestinian parable—thus exemplifying the predominant pattern. Sometimes the writer’s observations have the sharp edge of truth (“If you are unable to live in a compromised world, you should not teach”), but elsewhere his maxims are really a thin glaze on ordinary donuts. Pickering is playful, in teaching and in writing, and he relates some amusing encounters with grade-grubbing students, angry parents, dim-witted and unsmiling bureaucrats. But he also tells (with some evident pleasure) about times when he intentionally deceived folks, à la Loki and Huck Finn (writing and sending bogus crank letters, for example). He seems unaware that this sort of thing can compromise his credibility as a writer—and teacher—as it becomes fair to ask: Are his anecdotes here real? Or did he fabricate them to foment something? A talented teacher tells all—though not every impression we leave class with may have been in the lesson plan.